I’m seeking advice on what to do about a mistake that my contractor made on a remodel that I’m managing from afar. I explained that I wanted subway tile backsplash in the kitchen. The contractor sends me pictures of the tile to confirm I like it and I gave him the go ahead to put it in. I didn’t think it would be necessary to explain that I wanted it to go in horizontal as that is the common subway tile look. He ends up installing it very well, but vertically. It doesn’t look terrible, but is not the look I was going for. Am I to blame here for not communicating well enough? Should I have him fix the mistake and redo it horizontally on his dime? Any advice is much appreciated. While i am no expert in these matters this does seem to be a tricky one. 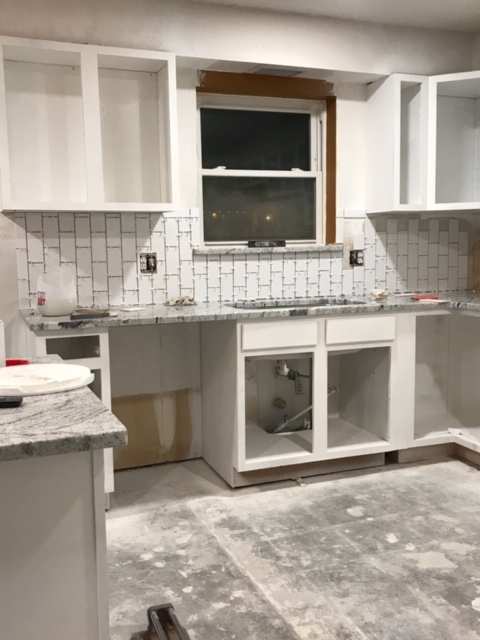 It is expected that subway tiles are placed horizontally (as you stated in your post), however if it was not specifically mentioned to your contractor then they used their own initiative (and went vertical). This being the case no-one is really at fault (you expected him to know, but he did not get specific directions on the orientation). I guess the first question is how much would it cost to redo this work, and possibly suggest a compromise where you spring for the materials and your contractor does the work (both at your own cost). You should of course let them know that you are not happy with the outcome of the work as it stands, and a lot will depend on your relationship with your contractor (and if they hope to get more work from you). If they agree then get it done and put it behind you, but if not then its probably not worth making a big deal out of it unless it will bother you for years to come (some people dont really mind these kind of things and others just have to get them fixed). Hope this helps and this is just my humble opinion. Maybe post some pics and get the general opinion about how they look...who knows people may prefer them that way. @Kellen Canfield If he is mid rehab just let it go, especially if he is a quality contractor overall, you want a long term relationship with him, and he is doing a good job otherwise on this project. You just know now going forward to be very specific with installation descriptions. We do flips here in CT and even when we are local to our contractors and/or employees these things still happen. Be lucky that a mistake was made and will not cost you any money. Most mistakes do. @Ian Middleton & @Michael Noto , thanks for the advice! Check out these pictures and let me know what you think. Did you say "I expected it to be horizontal."? Don't forget to lead with the positives about the job thus far, whatever they may be: quality, timeline is good, etc. and thank them for all the positives then say something along the lines of "Maybe this is my mistake for not spec'ing it but I assumed it'd be ran horizontally". I'll bet he's hoping you won't say anything but once you do he'll say "sorry, my tile guy got creative, I'll fix it". That's how these things have worked out for me nearly every time I run into this type of situation. I've never seen subway ran that way (doesn't mean it's wrong and some buyers may like it) but I don't think it's very common. Subway tile is pretty cheap and I usually pay a flat $300 for backsplash labor, so, if the GC won't change it on their dime, ask them to split the cost as the poster above suggested. If that's a no, then you have to decide what it's worth to you in cash and/or relationship if you want to fight the GC on it. Let us know what happens but definitely say something if it's bothering you. I honestly don't hate it and many times am surprised when something like that happens and I stress over it and either no one notices, cares or they even compliment it as different and interesting...happens often. You can talk to him (quickly) and see if he's willing to correct it, either for free or for a discounted price. It doesn't look awful. However, it's not "correct" because even an amateur would expect that tile to be installed horizontally, not vertically. What is he thinking?!? It's like building a brick house and installing all the bricks on end! @Kellen Canfield 1) Is this a flip or a rehab for you to rent out? 2) Ok, so sometimes a person can make a mistake and it turns out to change a trend, i.e. - the current trend of businessmen in suits wearing pants that look uncomfortably tight and show a lot of sock between the tops of their shoes and bottom of their pants. For generations men’s suits did not look like this, however it is now present in everyday life at almost every office everywhere. Another example, women expressing themself by wearing two different colored, non matching socks. One woman did it, now a whole group does on a regular basis. Not judging, just acknowledging that it happened, and others followed it and essentially made it socially acceptable to do dress like this. Unfortunately, in the case of your subway tile, once the adjective of subway, it completely means horizontal every time. The likelihood that your installer went to a subway station where the tiles were ran vertically and then that same person ended up installing your tile is a massive statistical outlier bordering on impossibility. Now let’s take into account that his/her technical knowledge is sound based on price and quality of install. His/her “eye for fashion” is way off the mark. Recommendation: If this is a rental, and your market dictates perfection at every turn, obviously come to a resolution with the contractor to rip it out and replace it. If your market will let it slide, then do the same. If this is a flip, and your market demands perfection, give a credit back to seller to get the deal done, if this is not the case, let it fly. 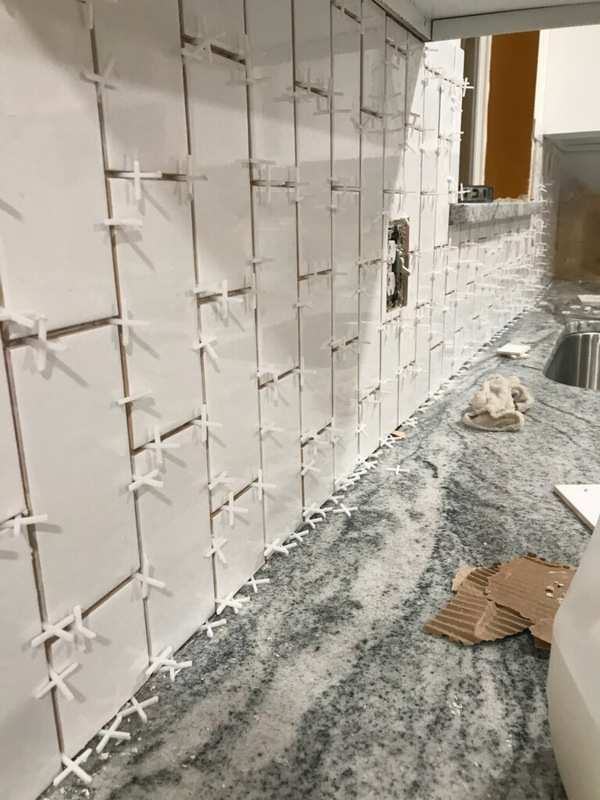 Most importantly, I doubt anyone walked away from buying the house they wanted based on the current owner’s backsplash selection. If your contractor is good on time, money and quality, explain your issue, and move on to the next project. Full disclosure: I’m an electrical contractor and I once watched a person install a fixture meant to go on a ceiling as a wall fixture above a bathroom mirror (the fixture was 3 independent lights hanging by 4” hollow metal tubes off of one common frame with the bottom of the bulbs facing out of the glass trims). Sadly, he presented it like he finished the Sistine Chapel, unfortunately he needed to be informed that no one would ever, under any conditions, accept that in their bathroom. He never made that mistake again. Best of luck, I think you’ll come out ahead on this one. Based on your pics the kitchen looks really good so far, sans the backsplash misdirection. If you didn't explicitly say "I want it horizontal", then it's up for interpretation. I don't recall any building code stating "subway tile will be installed horizontally". I've actually seen it installed diagonally too. Gave the kitchen a very different look altogether. 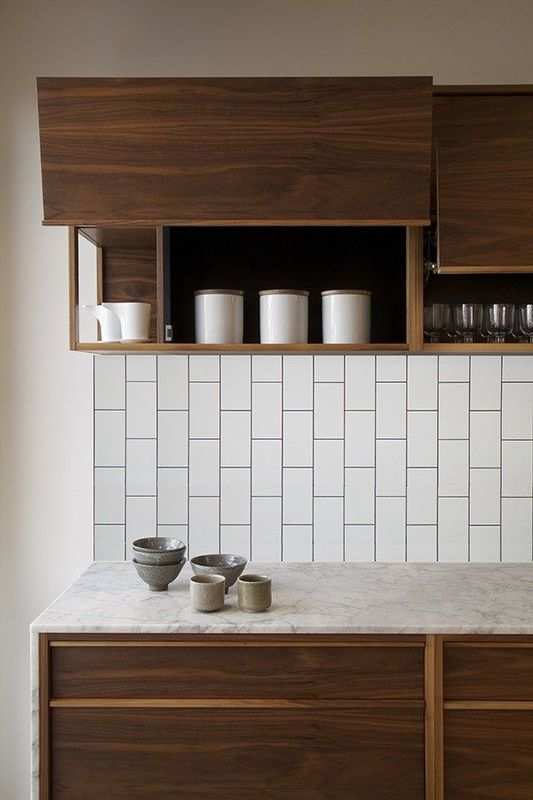 Google "vertical subway tile" and you'll have lots of kitchens and bathrooms with it. I'd say, ask him if he can re-install it horizontally, if that's the look you really want but don't fight with him over it. It's not worth losing a good contractor over this. @Kellen Canfield it might be that vertical is in right now in that area. It happens, I see vertical all the time now. It is definitely something that needs to be on paper these days with all the hgtv shows changing what's normal. It looks pretty good and will probably look even better once grouted. If you don't like it change it now before they grout. Nicely saying I thought it would be horizontal is probably a good approach like mentioned above, then how hard is it to change it. I think if you want it changed just pay to get it changed. They'll have the cost to demo back out too and re prepping the thin set isn't going to be fun so it's not going to be a simple fix. Maybe he'll offer to eat the markup or something. I remember having a brick fireplace painted and they painted it bright red, very odd looking, our normal spec was grey but we didn't do a full scope as it was just a minor rehab, paint and carpet. Our fault totally and we paid to have it fixed even though no one would have ever used that color (I know that's a cheap mistake in comparison). Ive had the opposite happen where we had subway tile installed and the designer verbally asked for it vertical. It got installed horizontal even though the designer was annoyed I asked her if she wrote it into the spec and it wasn't so I didn't even say anything to the contractor. They probably would have changed it for me free, but I was enforcing some systems to prevent this stuff in the future and it helped everyone understand the importance of a written scope and spec. without upsetting anyone too bad. It's fine, Kellan. I've seen it done this way, but then again, I've seen pretty much everything. It'll look better once he gets the grout in. And if this is the biggest RE problem you faced today, you're a lucky man. Chalk it up to experience and go on. I would discuss and have him redo it! Talk to him asap before he grouts! You are to blame for not being clear about your wishes. And he's also to blame for not asking how you want the tile installed. On the bright side, it doesn't look bad. In fact, it looks rather nice with the granite which is gorgeous. Thankfully, he didn't install it in a diagonal, herringbone or stacked pattern. I would mention it to him so he knows in the future not to take such initiative. But first, I'd decide if it's worth removing. If an investment, I wouldn't bother to incur the additional cost or time. If your own house, and time and cost aren't an issue, you'll want it redone because it'll bug you. If you leave it, consider having him install around the window, all the way to the soffit. It should help make the wall look taller. @Kellen Canfield the devil is in the details. I’ve made made mistakes like this by not being explicitly clear. I’ll typically show pictures now, I have a folder on my phone of my expectations. Situations like this I’ll have an honest conversation and come to a middle way. So maybe I pay a little but to cover the extra work because I didnt explain in detail. Especially if they are a good contractor which is hard enough to find you want them to take your calls. @Kellen Canfield Hi Kellen, from the pics it doesn’t look bad, just not what you expected. There are some good posts from others which go over the options pretty well, so final call is with you, but as one other post mentioned don’t wait if you decide to change, just push ahead. Good luck with the rest of the rehab. I would say when you get a contractor to do this stuff you must be very specific in your requests . Every little detail must be addressed or there’s problems .however, If he was going to do something unorthodox like this he should have brought that out to your attention before doing it . I think it looks trendy and cool . Something original , something different that gives it some pizzaz in the room and I bet once it’s done you will agree . @Kellen Canfield Vertical is in right now. He couldn't of interpreted your expectation albeit, should of asked if he wasn't positive. The tile can be installed vertical or horizontal... Pull the install spec if you don't believe me. There is no code references in the IBC for which way backsplash tile goes (just fyi). Most of our bathroom installs are going vertical because it optically raises the height of the room. Still go horizontal on our kitchens though... Hehe! At any rate, I wouldn't make a big deal out of this specifically... Instead chalk it up to a learning experience and adjust your directions in future. If he's a good contractor, keep him happy. They are tough to find. You mentioned that you are managing the remodel from another state. It could be that your contractor is following local trends by going vertical. I know that my tile distributor injects a lot of their personal styles on pros through their design center. Personally, I kind of like it and I don't know that it detracts from the kitchen. I think a buyer or renter that runs from your property over that has bigger issues. On another note, as a contractor and investor, I make sure that I always nail down specifics on materials, part numbers, installation, etc. It avoids a lot of controversy and wasted time later. I might suggest you create a template on the computer to use a small a build schedule. I'll try to attach an example that I've used in the past. If you would like the entire document, PM me your email and I'm happy to share. It is you who failed to conveyed the specifics on directionality. Unless it is stated in the contract signed by both you and contractor with sketches. Then you have a legit cause. You can ask them to split the cost for the trouble. These little things are not real problems. I think sometimes we respond emotionally when you can take a step back and realize this will work perfectly for the end buyer. I say let it go and in the future be more specific in what you want done. Just my $0.02. Good luck. I’d leave it. It looks good. When you set aside what your expectation was there’s nothing objectively unattractive about it and I’m sure you’ll have people who prefer it because it’s something a little different than everyone else has. There is no excuse for him at the very least asking you which direction. He may have the talent to install but certainly not the design sense. @Kellen Canfield Is your rebuild modern? If so its actually being used i wouldnt worry. Honestly i wouldnt worry anyways itll look nice. Voice what you wanted anyways maybe he’ll change it. Backsplash isnt expensive and so he knows what you prefer and expect for the next one. @Kellen Canfield i think it looks great. @Kellen Canfield If you did not specify horizontal in agreement or send him a pic of what you wanted, you can't hold the contractor responsible. I guess I am OCD about these things because I get crazy when I see crown mold upside down or stuff like this. When I ask a trim guy what Cyma Recta is and he think its a proctologist term I know I need someone else to do my crown. I agree with what @Troy S. says though. Just explain it like that and see where it goes. I don't think its all on you and I am in construction myself. Its almost like saying if you didn't tell them to not hang the door upside down then its on you if they do. You as a client should expect a certain level of professionalism from the people who you pay. Subway tile is traditionally horizontal. So before they did it vertically they should have cleared it with you first.